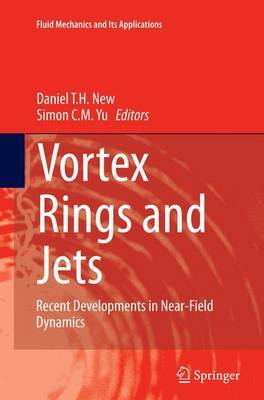 In this book, recent developments in our understanding of fundamental vortex ring and jet dynamics will be discussed, with a view to shed light upon their near-field behaviour which underpins much of their far-field characteristics. The chapters provide up-to-date research findings by their respective experts and seek to link near-field flow physics of vortex ring and jet flows with end-applications in mind. Over the past decade, our knowledge on vortex ring and jet flows has grown by leaps and bounds, thanks to increasing use of high-fidelity, high-accuracy experimental techniques and numerical simulations. As such, we now have a much better appreciation and understanding on the initiation and near-field developments of vortex ring and jet flows under many varied initial and boundary conditions. Chapter 1 outlines the vortex ring pinch-off phenomenon and how it relates to the initial stages of jet formations and subsequent jet behaviour, while Chapter 2 takes a closer look at the behaviour resulting from vortex ring impingement upon solid boundaries and how the use of a porous surface alters the impingement process. Chapters 3 and 4 focus upon the formation of synthetic jets from vortex ring structures experimentally and numerically, the challenges in understanding the relationships between their generation parameters and how they can be utilized in flow separation control problems. Chapter 5 looks at the use of imposing selected nozzle trailing-edge modifications to effect changes upon the near-field dynamics associated with circular, noncircular and coaxial jets, with a view to control their mixing behaviour. And last but not least, Chapter 6 details the use of unique impinging jet configurations and how they may lend themselves towards greater understanding and operating efficacies in heat transfer problems. This book will be useful to postgraduate students and researchers alike who wish to get up to speed regarding the latest developments in vortex ring and jet flow behaviour and how their interesting flow dynamics may be put into good use in their intended applications.